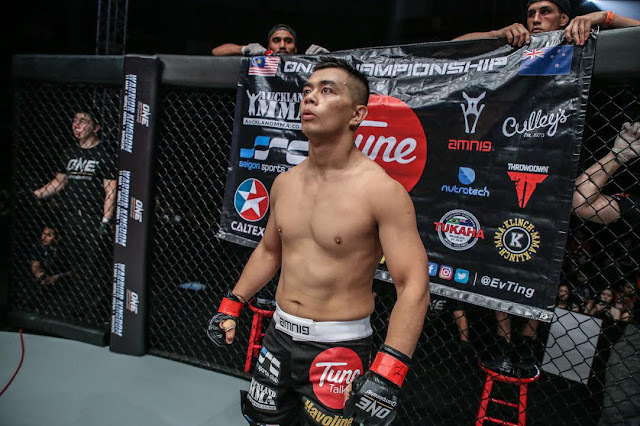 Although he has defeated a handful of Filipino competitors inside the mixed martial arts (MMA) cage, Malaysian-Kiwi sensation Ev “E.T.” Ting speaks highly of the dauntless prizefighters who proudly donned the Philippine colors in the sport. Ting, a 27-year-old full-blooded Malaysian who grew up in Auckland, New Zealand, has crossed paths with seven Filipino stalwarts in his celebrated 16-fight career that commenced in April 2011. “E.T.” has won six of his seven bouts against Filipino fighters, with the only loss coming at the hands of Filipino-American standout Mark Striegl via first-round technical submission in February 2011 under the banner of a regional MMA promotion. After making an impact in his ONE Championship debut against Indonesia’s Yohan Mulia Legowo in June 2014, Ting’s reputation as a serious threat to Filipinos was raised to a notch higher, knocking out Edward Kelly with a first-round high kick in October 2014 before forcing Cary Bullos to tap with a second-round guillotine choke in March 2015. Ting had a vindictive follow-up by defeating former ONE Featherweight World Champion Honorio Banario in just 56 seconds with a first-round guillotine choke in October 2015. In January 2016, Ting notched a huge victory over Eric Kelly, who is widely regarded as one of the greatest Filipino fighters that the Philippine MMA scene has produced. Following several back-and-forth sequences of takedowns and submission attempts, Ting was able to compel Kelly to wave the white flag for the first time in his illustrious professional MMA stint with a third-round guillotine choke. Outside the confines of ONE Championship, Ting also holds impressive wins over the likes of Filipino-Kiwi combatant Mark Abelardo and homegrown talent Rolando Gabriel Dy. Despite the fact that he handed heartbreaking setbacks to Pinoy contingents, Ting is all praise to every Filipino fighter who pours out their burning passion for the sport each time they step inside the cage. Ting admitted that his cage encounters with Filipino athletes in MMA had a big contribution to his success and to where he is presently. “Filipino fighters are tough as nails. Most of the Filipino fighters that I faced in the past brought out the best in me. With the battles that I’ve gone through with them, I don’t know if I will be in this position right now. I am thankful for that,” he stated. Ting will be facing another Filipino in his next outing as he is set to challenge Eduard “Landslide” Folayang for the ONE Lightweight World Championship title in the main event of ONE: KINGS OF DESTINY on 21 April. The scheduled five-round championship clash will take place at the 20,000-capacity SM Mall of Asia Arena in Manila, Philippines. Ting secured a date with Folayang when he scored a split decision win over former lightweight title challenger Kamal Shalorus last February. “I have worked tirelessly to be where I am now. It has finally paid off because I will get an opportunity to vie for a world title. It's every mixed martial artist's dream to become a champion. This is my chance to fulfill that dream,” Ting stressed. Even if Folayang will have the whole crowd cheering for him in their highly-anticipated confrontation, Ting is not bothered by it as his whole focus is on bringing home the gold-plated strap. “Eduard Folayang is a great champion and is admired by many Filipinos, but he has what I want. I'm coming to Manila to get it from him and bring the belt home to Malaysia,” he ended.